Bien venidos a nuestra gran familia. / Wellcome to our grand famuily. Estamos muy orgullosos de nuestra familia. / We are so proud of our Family. Somos una familia muy grande con valores, prinsipios y buenas costumbres. Creemos en la union familiar, en el respeto y el amor a los demas asi como a nosotros mismos. Somos seres humanos como cualquier otro, sensillos y humildes pero muy orgullosos de ser lo que somos y de donde venimos. Nuestra gente se distingue por trabajadora, luchista, progresista y siempre sacrificandose por darle lo mejor a sus respectivas familias. somos una familia con buenos sentimientos, con una actitud positiva hacia la vida y siempre dispuestos a brindarle una mano amiga y una sonrriza al necesitado. Por esto y por mucho mas nos sentimos muy oirgullosos de nuestras raices y de pertenecer a esta gran familia, nuestra familia, tu familia. We are a great family with values, principles and good customs. We believe in a united family, in respect, and love for everyone as much as ourselves. We are human beings like anyother, simple and humane but very proud of being what we are and coming where we came from. Our people are distinguished by hard workers, perseverant, progressive, and always sacrificing to give the best to their respective families. We are a family with good feelings, with a positive attitude towards life and always willing to give a friendly hand and a smile to the needy. Becuase of this and much more we feel very proud of our roots and to belong to this grand family, our family, your family. 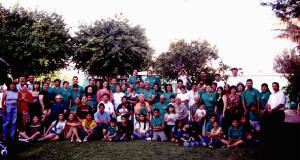 Click aqui para visitar tu arbol genealogico/click here to see your family tree.